Our Tee Times Vouchers are for booking Non-Event Casual Golf; any member can bring up to three guests at the member price. 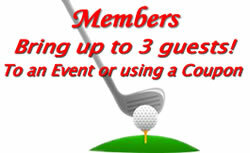 As an Empire Golf Club member you may purchase tee times and play at participating private, public and resort courses. Browse through our selection and find a course for you. Check back often for new courses becoming available throughout the season, and read our member emails and follow us on Facebook for updates. Sign up for events and/or purchase Tee Time Vouchers by clicking any of the links to the left for that specified event or tee time voucher.